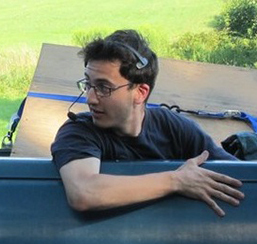 Eli Shapiro is a writer, director, comedian, and person. He graduated from NYU Tisch with a BFA in film and television, where his comedy film THAT FRIEND YOU HATE was a Wasserman Finalist and won Craft Awards in Screenwriting, Ensemble Acting, and Editing. Eli’s short film IKE INTERVIEWS GOD won First Prize and awards for Best Writing and Best Acting at NYU’s New Visions and Voices Festival. As a writer, his feature screenplay “More Than Cold Feet” was a 2014 quarterfinalist in the Academy of Motion Picture Arts and Science’s prestigious Nicholl Fellowship, and a semifinalist in the Austin Film Festival Screenplay Competition. Eli’s short films have screened in cities all around–-in New York, LA, Seattle, Boston, DC, and even Rome. Eli has worked for some of his favorite people-–in production on feature films, such as THEY CAME TOGETHER starring Paul Rudd and Amy Poehler and THE MAGIC OF BELLE ISLE starring Morgan Freeman; TV shows, like “Louie” on FX; in development at Scott Rudin Productions and Unique Features; and talent management at Lasher Group. A New Jersey native, Eli does a pretty good Woody Allen impression, and can be seen performing stand-up around NYC. © 2019 JRJ Awards. All Rights Reserved. Theme By: TidyThemes.